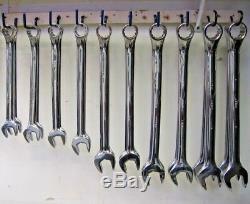 URREA PROFESSIONAL TOOLS 10 piece jumbo combination wrench set. URREA warrants its product to be free from defects in material and workmanship. Any URREA product which has not been altered, misused, or abuse, and fails during its normal useful life, will be replaced or repaired at no charge. Our USA operations and warehouse in San Antonio TX. Manufactured from steel micro-alloyed with high-quality chrome-molybdenum, hot forged for greater durability. Precision machined and heat-treated to provide the best combination of hardness, tensile strength, and torsion resistance. 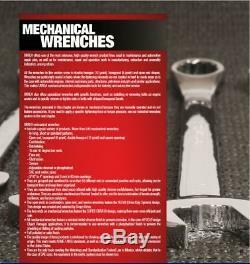 Mechanical wrench ends incorporate the SuperDrive design to make them even more efficient and safe. 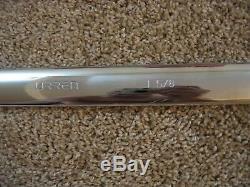 All URREA mechanical wrenches have a rugged nickel-chrome finish for corrosion resistance. Comply with national and international, American and European standards. URREA´s modern manufacturing facilities in Guadalajara, México, with a talented engineering and production staff produce professional quality tools for export throughout the world. The company´s 260,000 square foot facility easily keeps pace with the increasing demand for URREA products. Using the latest CAD-CAM computer design and manufacturing technologies to ensure the precision and quality of the finest tools available. Each URREA tool is forged from special, made in USA, micro alloy steel and machined with state-of-the-art equipment, tested and inspected throughout the manufacturing process to meet or exceed all ANSI, US FEDERAL and SAE specifications. The manufacturing facility has achieved the ISO-9001 certification. Product engineers and customer service representatives, are available to assist you in the application and use of tools. They will help familiarize you with new tools and provide demonstrations of any tool in our line. Urrea tools are forged from special, made in USA, micro alloy steel and machined with state-of-the-art equipment, tested and inspected throughout the manufacturing process to meet or exceed all ANSI, US FEDERAL and SAE specification. Urrea's modern manufacturing facilities in Guadalajara, Mexico uses the latest CAD-CAM computer design and manufacturing technologies to ensure the precision and quality of the finest tools available. URREA manufactures its tools following technical standards. A product technical standard is a document specifying design and manufacturing guidelines to ensure adequate product performance under conditions that meet users requirements. These standards are issued by private or government bodies and associations. The only organization to issue international standards is known as ISO (International Organization for Standardization). It issues the ISO 9000 series, related to quality systems, although it also issues product technical standards. In the United States there are various associations that issue or used to issue standards, such as GSA/US FEDERAL, ASME, ANSI, and SAE; similarly, in Europe there is DIN Deutsches Institut für Normung e. German Institute for Standardization, which groups together different organizations and committees dedicated to promoting standardization and quality on products commercialized in Germany. 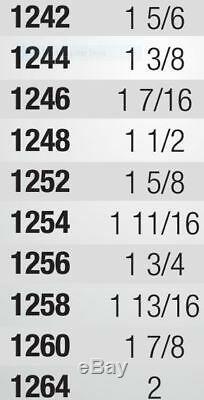 Hand tool standards, known as Federal. (in Mexico) are no longer updated and are being absorbed by ASME. The same is happening to standards issued by ANSI. Nowadays, ASME hand tool standards are initially reviewed by committees formed by different tool manufacturers, users and distributors so they can be approved and issued by ASME. SAE standards (in particular are those applicable to aerospace industry) are stricter standards, that for the most part, demand smaller tool dimensions and greater resistance. 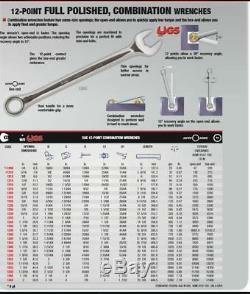 STANDARDS APPLICABLE TO: MECHANICAL WRENCHES. 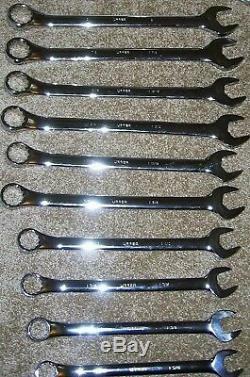 DIN3111:1982-11 Box wrenches, single end; test torques series A DIN3113:1984-11 Combination wrenches with equal openings; test torque series A and C DIN3117:1988-05 Adjustable wrenches, open end GGG-636 Wrenches (Box, open, and combination) GGG-1405 Wrench, box (Ratcheting) GGG-631b Wrenches, adjustable; Open-end, Auto And Monkey GGG-1437 Wrench, socket and box end GGG-345 Gauges, Wrench Opening B107.8 Adjustable Wrenches B107.100 Wrenches This standard incorporates: B107.6, B107.9, B107.39 and B107.40 B107.17M Gages, Wrench openings, reference AS954 Wrenches, Hand, Twelve point, high strength, thin wallISO 1085 Assembly tools for screws and nuts Double-ended wrenches Size pairing ISO 6787 Assembly tools for screws and nuts Adjustable wrenches ISO 7738 Assembly tools for screws and nuts Combination wrenches Lengths of wrenches and maximum thickness of heads ISO 10103 Assembly tools for screws and nuts Double-headed, flat, and offset box wrenches length of wrenches and thickness of the heads ISO 10104 Assembly tools for screws and nuts Attachments for hand-Double headed, deep offset and modified offset, box wrenches length of wrenches and thickness of the heads. If you have any problems or concerns whatever with your order or products, please message us and give us a chance to assist you before you leave any feedback. We believe we can produce a positive outcome to any situation and will work hard to earn your praise. Your feedback is very important to us. 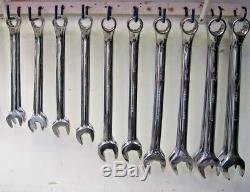 The item "Jumbo Wrench set 1-5/16,1-3/8,1-7/16,1-1/2,1-5/8,1-11/16,1-3/4,1-13/16,1-7/8,2" is in sale since Monday, November 12, 2018. 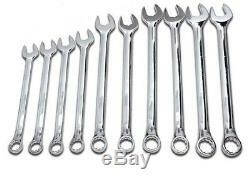 This item is in the category "Home & Garden\Tools & Workshop Equipment\Hand Tools\Wrenches\Wrench Sets". The seller is "toolsbyed" and is located in Saint Paul, Minnesota. This item can be shipped to United States.